The EUR/USD pair has completed yet another ascending leg on the back of news. Today the market is trading within yet another descending impulse. 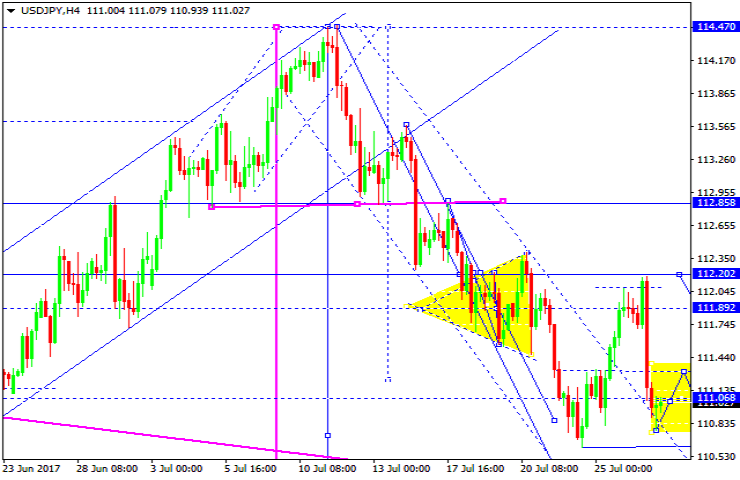 The structure can be extended towards the 1.1717 level. 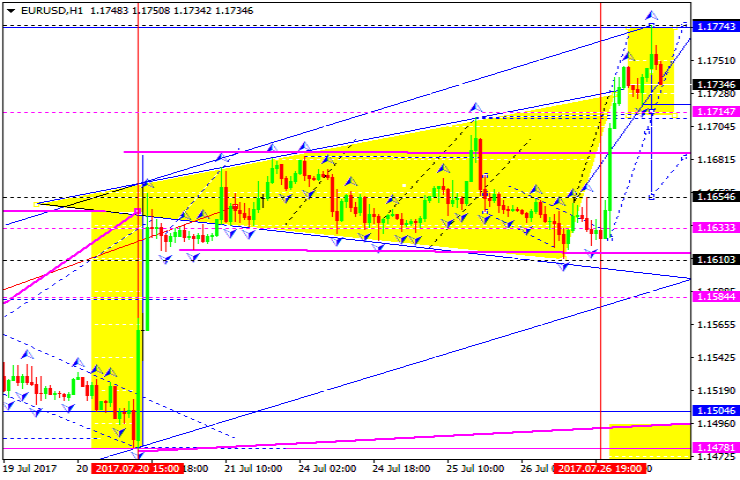 Then it can go higher to reach 1.1746. After that it can decline towards 1.1655. The GBP/USD pair has extended its consolidation range from bottom upwards having completed a previously calculated move. For today we'd consider a descending move towards 1.3098. Then a consolidation range may come to the fore. If the current range is broken through from top downwards, the price can go lower towards 1.3020. In case the upper edge is broken, the pair can rise to reach 1.3230. The USD/CHF pair has almost completed its correction wave on the back of news. For today we'd look into development of a consolidation range at low values. If the 0.9527 level is broken, the pair can move higher towards 0.9550, and then it can develop a fifth wave to hit 0.9611 level. The USD/JPY pair is trading within yet another descending wave after having rebounded from 112.20 level. For today we'd consider a consolidation range near 111.07 level to be developed. If it is broken from top downwards, the 109.97 level can be achieved and hit. If the range is broken from bottom upwards, it will not be improbable that the pair moves back towards 112.20. After that it can show a downward move to reach 109.97. The AUD/USD pair has broken through the consolidation range from bottom upwards and has completed the calculated move. For today we'd consider a downward move towards 0.7970. 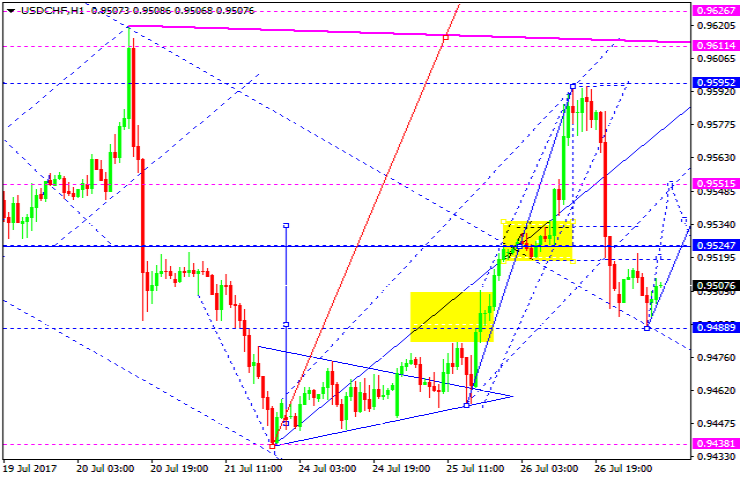 Then the pair can move higher towards 0.8015. 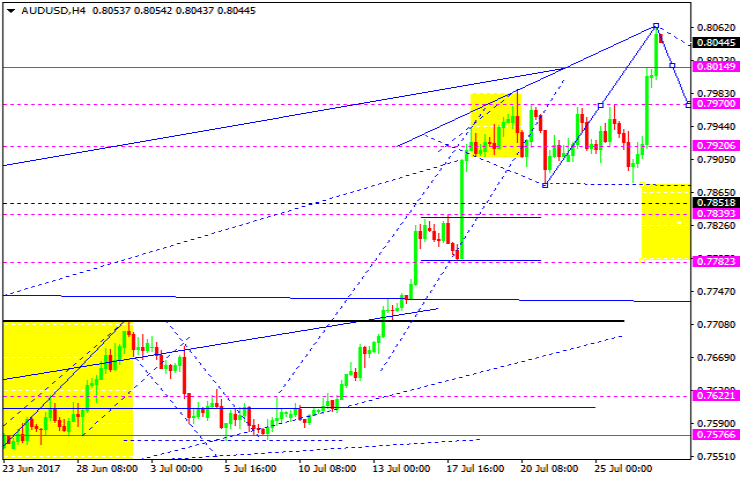 After that the descending wave can be extended to reach 0.7860 level. The USD/RUB pair is trading lower towards the 59.43 level. Then it can go higher to reach 59.66. 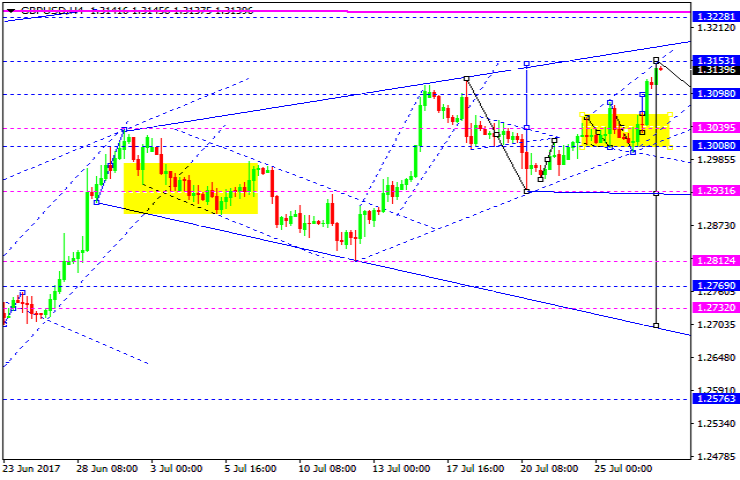 After that the pair can develop a descending wave to reach 58.64 level. 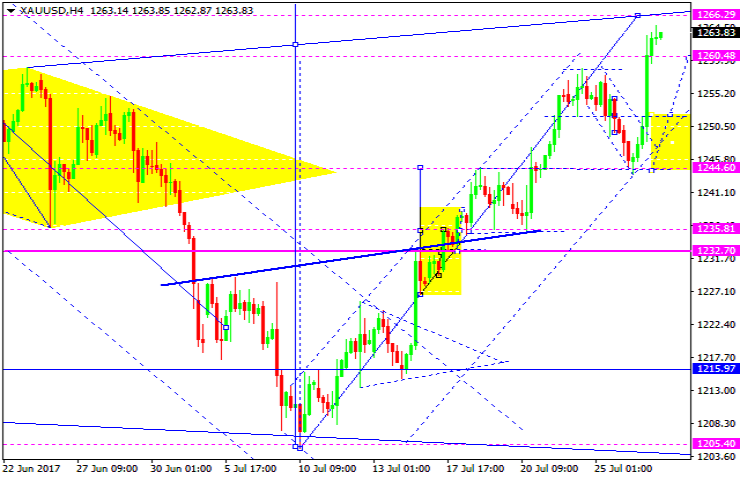 Gold has completed its ascending wave and hit the wave's target. For the moment the market retains enough power to elongate the ascending structure towards 1266.30 level. Then a consolidation range at maximum values can occur. If the range is broken from top downwards, a correction move towards 1233.00 is possible. Oil is trading higher but facing difficulties. We'd consider a possible move towards 51.40 level. 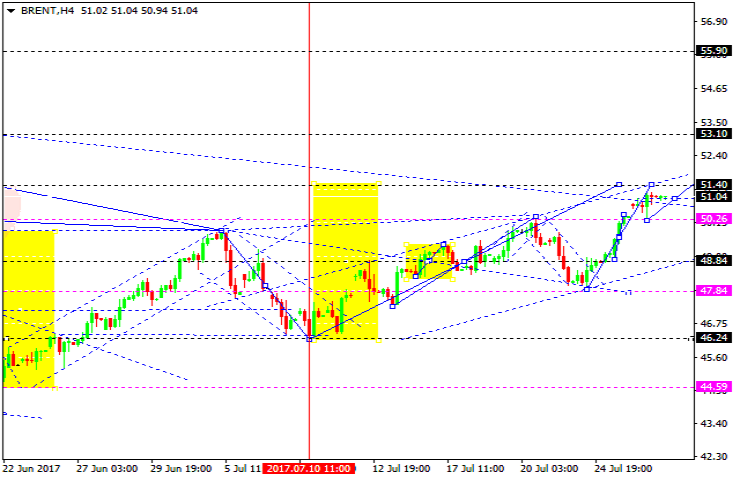 Then the pair can form a correction move towards 48.84 level. 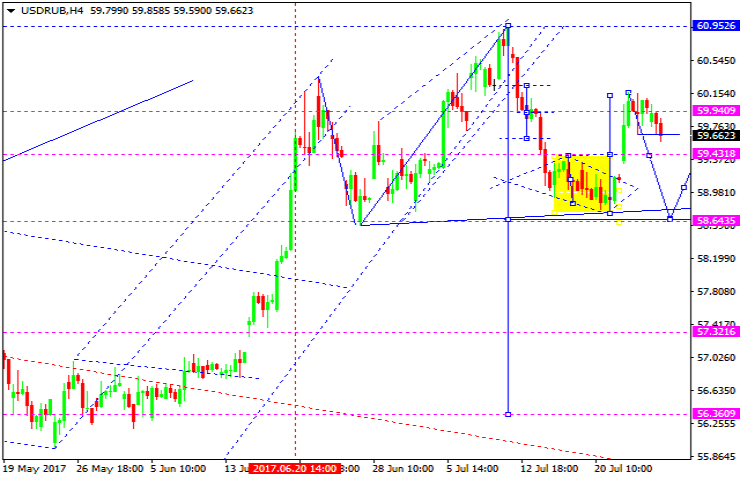 After that it can move higher to reach 53.10 level.